Published by Julia MacRae Books 1986 Now Out of Print. This is a small volume that I treasure, and at just 3 and a half inches tall by 3 wide, it is one of the smaller books I own. With detailed illustrations by John Lawrence. 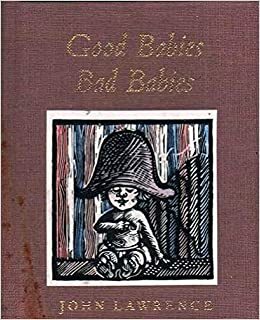 It is, perhaps just a catalogue of babies: Good, Bad (I particularly like the engraving for the Bad Babies), Sweet, Sour, Bald, Curly, Fat, and “Fin Ones”… all the way through to “Bye Bye Baby Ones”. The above illustration is taken from the Internet. That copy has a stain across the front board and spine. I have to say mine is in mint condition. Do be careful when purchasing second-hand or antiquarian books off the Internet. Unless you really just want the text; the condition is all important! It is a little gem of a book.